Many Australians have died or have been seriously injured from quad bikes (four-wheeled motorbikes) – including children. Watch the video and follow the safety steps to prepare, wear and ride safely when using quad bikes. Quad bikes are not ALL-terrain vehicles. It’s a popular belief that quad bikes can safely go on all kinds of terrain and surfaces. Unfortunately, this isn’t true – riding on steep slopes, rough terrain and even hard, flat surfaces (such as tarmac and asphalt) may cause the quad bike to become unstable and very dangerous. Quad bikes can be fun and useful to get around in, but can pose a number of safety hazards. Even if you are an experienced rider, quad bikes can put you and your loved ones in danger. Video: Quad bike safety – would you risk it? Watch the video to see just some of the potentially deadly dangers quad bikes can pose. In Australia, there have been 20 reported deaths associated with quad bike use in 2015, and a total of 75 reported deaths during the years 2011-2014. The quad bike-related deaths so far in 2015 include a six-year-old, a seven-year-old and a 15-year-old. at least one in three victims was not wearing a helmet. Follow these safety steps when using quad bikes to help you and your loved ones stay safe. Ensure you are properly trained before you ride a quad bike. Maintain the bike so it is in safe condition. Read the operator manual and observe the manufacturer's safety warnings and recommended use of the vehicle. Before you leave for a quad bike ride, always tell someone where you plan to go and when you expect to return. Wear protective clothing and gear such as goggles, long sleeves, long pants, boots and gloves/hand protection. Never let children ride quad bikes that are meant for adults – even as passengers. Do not carry any passengers on quad bikes that are meant for one person. Quad bikes are not all-terrain vehicles so they cannot go safely on all types of terrain. Avoid riding on rough terrain or steep slopes. Ride on familiar tracks and beware of obstacles. Never ride under the influence of alcohol/drugs. 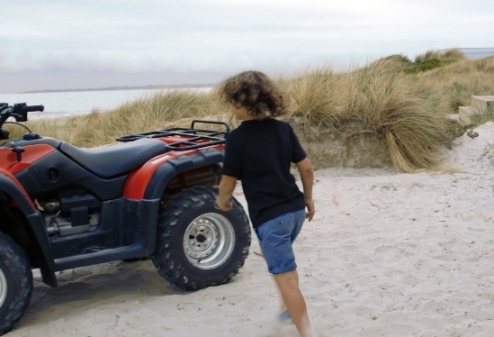 Ensure children are supervised at all times near any quad bike activity. Always carry a mobile phone or radio device so you can contact for help in case of an emergency. Download the posters in the link below to display to your customers at the point of sale. Share the Quad bike safety – would you risk it? YouTube video on your website and social media channels. Share the safety steps above via your website and social media channels.